Amy Brown’s catalog of fantasy and fairy designs includes more than 2,000 works of art stretching over more than two decades of her career. Active since the 1990s when she was working in a small art gallery, today Brown has more than 1 million Facebook followers eagerly anticipating her every release. Today, 5 oz Colorized Proof Silver Amy Brown Collection Haunted Pumpkin Patch Rounds are available to you at Silver.com. Rounds ship to you inside of protective capsules with a Certificate of Authenticity! Special Halloween-themed release for the fall! Obverse includes a fairy in a haunted pumpkin patch. Reverse depicts the image of the fairy Dusk. Creations from Amy Brown, series by Julie Lindquist. 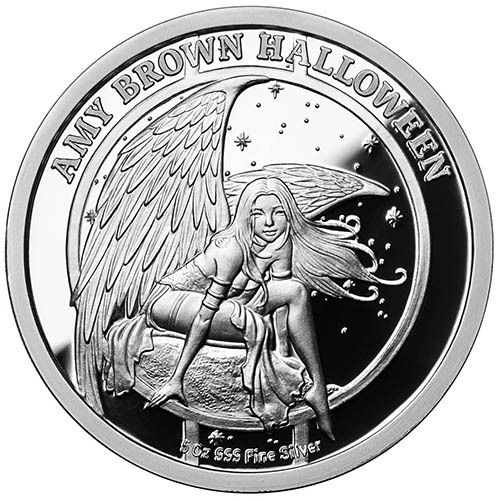 The Amy Brown Collection from the Anonymous Mint ran through 2018 and featured six famed fairy designs hand-selected by lead coin designer Julie Lindquist. Each design was brought to life on the rounds with the die carvings created by Italian Master Sculptor Luigi Badia. Now, just in time for fall, there is a new Halloween-themed fairy release. 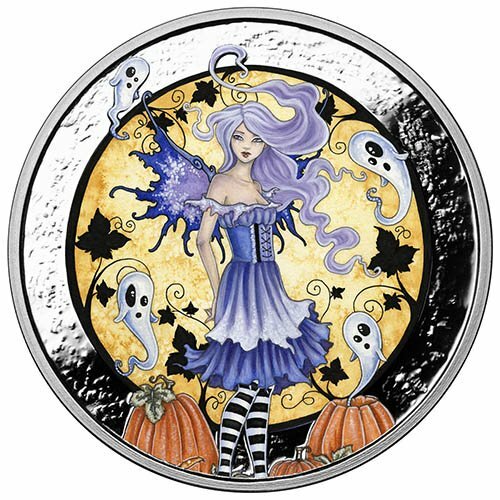 All 5 oz Colorized Proof Silver Amy Brown Collection Haunted Pumpkin Patch Rounds are currently available to you from Silver.com with a protective capsule. The individual rounds have their unique serial numbers etched onto the edge and the included Certificate of Authenticity comes with the matching serial number on it. The colorized proof silver rounds in the Haunted Pumpkin Patch release depict the work of Brown as she originally created it with watercolors. The fairy wears shades of purple on her dress, has long, lavender hair, and wears black-and-white striped socks. All the colors of fall and Halloween feature in the background as well. On the obverse of 5 oz Colorized Proof Silver Amy Brown Collection Haunted Pumpkin Patch Rounds is the image of a single fairy standing in the middle of a pumpkin patch. Her tiered dress has shades of purple and white ghosts play with her lavender hair. The moon that fills the background is a haunting shade of yellow, with orange pumpkins visible at her feet. The reverse of Colorized Proof Haunted Pumpkin Patch Rounds includes the design of Dusk. The fairy known as Dusk was created in 2003 by Brown and depicts a powerful fairy with large, bird-like wings. With a dreamy gaze in her eyes, she stares out over the realm from her high perch. Please feel free to reach out to Silver.com if you have any questions. You can contact us on the phone at 888-989-7223, chat with us live online, or simply send us an email with your inquiries.